Toyota recently unveiled the newest member of their lineup at the Los Angeles Auto Show. The 2018 Toyota C-HR (Coupe High-Rider) is the next step in Toyota product history. This new model was originally introduced as the Scion C-HR concept vehicle at the 2015 Los Angeles Auto Show. The well-received design with avant-garde body styling and a modern cabin that is comfortable and functional has moved from concept to production model and will be available Spring of 2017. 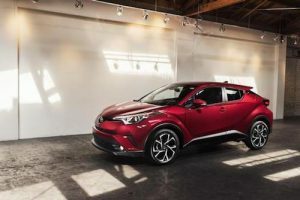 The new Toyota C-HR will be available as either the XLE or XLE Premium model, both will be generously equipped with standard features including dual-zone climate control, supportive bucket seating, 7-inch audio display, 18-inch allow wheels and the Toyota Safety Sense system. It will be powered by a 2.0-liter four-cylinder engine capable of 144 horsepower and 140 pound-feet of torque. The engine utilizes Toyota’s latest generation of technologies including Variable Valve Timing (VVT) and Valvematic for enhanced fuel economy and smooth operation. Racing enthusiasts will feel at home in this new model when they select the Sport mode, simulated 7-speed sequential Shiftmatic. While in Sport mode the MID increases the responsiveness of the throttle, and quickens the CVTs for “step-up” shifting while maintaining high engine speeds. A Sequential Shiftmatic feature that lets drivers shift simulated gears at their convenience, is easily engaged by pushing the gearshift to the left while in Drive. After years of developing the C-HR’s driving performance, the ride quality of this new model is unsurpassed. The body has a low center-of-gravity and has been built with low weight, high strength materials. It rides on newly developed McPherson struts with SACHS dampers and benefits from a large diameter stabilizer bar for quick response and precise handling. Many creature comforts have been added to this new model. These include a surround speaker system, leather wrapped multi-function steering wheel, heated mirrors, backup camera, auto dimming rear view mirror and an electric parking brake. The new Honda C-HR has also been built with a remarkably quiet cabin created with the use of sound insulating materials in the carpet, headliner, A-pillars and the door trim. Our Toyota Dealership in Rochester, New Hampshire is anxiously anticipating the arrival of this exciting new model. If you would like to learn more about the all-new 2018 Toyota C-HR and expected arrival dates please contact us.